In 1960 John Steinbeck and his dog Charley set out in their green pickup truck to rediscover the soul of America, visiting small towns and cities from New York to New Orleans.The trip became Travels With Charley, one of his best-loved books. 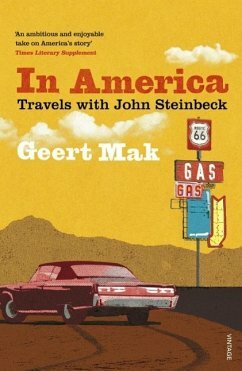 Half a century on, Geert Mak sets off from Steinbeck's home. Mile after mile, as he retraces Steinbeck's footsteps through the potato fields of Maine to the endless prairies of the Midwest and stumbles across glistening suburbs and boarded-up stores, Mak searches for the roots of America and what remains of the world Steinbeck describes. How has America changed in the last fifty years; what remains of the American dream; and what do Europe and America now have in common? Geert Mak is a journalist and historian, and the internationally acclaimed author of In Europe, Amsterdam and The Bridge. He is one of the Netherlands' bestselling authors, has twice been awarded Historian of the Year and his books have been translated into more than 20 languages.